Good news, friends - the tiara is no longer an elite piece of jewelry reserved only for the aristocracy (unless you happen to be part of the aristocracy...then, congratulations! How's are things amongst the titled?). It used to be that it could only be worn during formal occasions, particularly if the dress code was white tie (an even fancier version of black tie), but start spreading the news: Times have changed! 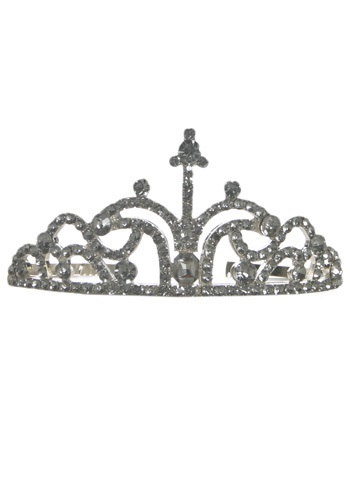 Now, you can slip on this Rhinestone Tiara for any occasion! Wear it around the house when you're feeling like Sophia Loren...slip it on when you're playing dress-up...or use it as a sparkly addition to your next costume or formal occasion! And do it all without any fear of being arrested and imprisoned for impersonating a person of nobility, as would have certainly happened at any time before the 20th Century! Ah...enjoy the freedom of these modern times!